From flying high, to getting grounded - a whirlwind set of workshops and lectures for Al Qamar kids! 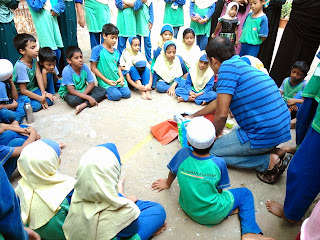 Mr. Ismail Mehmood, an engineer/ entrepreneur turned Organic Terrace Gardener conducted a workshop for Al Qamar children. He started off with a slide show on what is organic gardening, what substitutes are used for fertilizers and as pest repellents. He then had a slideshow on the various plants he is growing on his terrace - gourds, grapes, herbs, ornamental plants et al. He then demonstrated how to plant - by making potting mix, putting in the seeds and spraying lightly. The end - an organic gardening club has been formed and children signed up with enthusiasm.